The book follows the Chicago-based Telemachus family, three generations of whom are living with patriarch Teddy Telemachus. It is the early 1990s. In the 1970s, the family — Teddy, wife Maureen and the three children Irene, Frankie, and Buddy — were the Amazing Telemachus Family. They were psychics, riding high on the TV circuit until their act was cruelly destroyed by a debunker on the Mike Douglas Show. The weird thing, though, is that except for card-shark, scam-artist Teddy, no one in the family was a fake. Maureen, especially, was a psychic and a remote viewer, perhaps the most powerful psychic living. Irene was a human lie detector; Frankie could move objects with his mind; and the youngest, Buddy, could see the future. Through shifting points of view and various flashbacks, Gregory shows us the courtship and early days of Maureen’s and Teddy’s marriage… and their work with the US government. Maureen died when she was thirty-one, of cancer, leaving Irene, eleven, to try to raise the family, because Teddy simply wasn’t capable. In the 90s, economics have forced Irene and her fourteen year old son Matt — Matty — to move back in with her dad and her strange youngest brother Buddy, who rarely speaks and is always engaged in some weird building or demolition project around the house. Frankie, who is married with three kids, is underwater in debt to the local mob… a crime family with whom Teddy has history. 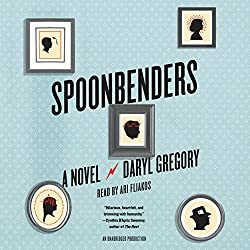 As Spoonbenders opens, Matty, who is spying on his sixteen-year-old cousin Mary Alice, learns abruptly, in the most embarrassing way possible, that he can astrally project. This realization sets many things in motion. Frankie sees Matty’s ability as the linchpin of a disastrous plan to solve his debt. Teddy, meanwhile, engineers a “random” meeting with a woman in a local grocery store. Irene cautiously takes up online “chatting” and meets a man she likes, but the obstacles between them are major. We watch as Teddy reconnects with the agent who case-managed Maureen when she did remote viewing for the government. For Destin Smalls, the agent, the collapse of the Soviet Union means the end of his world, and he is desperate to keep his government program funded. If any of the Telemachus progeny, especially second-generation, have psychic skills, Smalls believes he can get his program fully funded. Teddy plays not one but two dangerous games of cat-and-mouse as he tries to fend off Smalls’ interest in his family and rescue his new friend Graciella from her ruthless mob father-in-law, Nick Pusatieri. Frankie’s plan brings him and the family closer to the edge of the precipice. These storylines seem parallel and random, but for at least one person in the Telemachus family, they aren’t random at all. Shifting points of view let us see different facets of this complex family. Teddy, who loved Maureen and his children, was emotionally cowardly when Maureen needed him most, and completely unequipped to raise kids, even though he is a smart, shrewd man. We wonder what it would be like to be Matty, a fourteen-year-old boy with a mother who can always tell if he is lying. (A running joke is that family members answer Irene’s questions with a question, and one time she says to Teddy, “Don’t you Trebeck me, Dad.”) Frankie, who seems like a desperate and selfish loser, remembers back to his childhood; Maureen’s close bond with vulnerable Buddy meant there was “no room” for him. Buddy is the most gifted of the family, completely, genuinely prescient; and this means that he is never completely sure where he is in time. He stops talking to his family because he is afraid he will say something that will change the future or the past, because he can’t always distinguish those two. Irene can only tell if a person knows they’re lying; she can easily be taken in by a person who believes what they say when they say it. Along with a convoluted plot that never seemed slow, Spoonbenders creates little slices of Chicagoland life, mostly through the point of view of Matty, as he takes a summer job with his Uncle Frankie and sneaks out at night with Mary Alice (who goes by Malice). There are riverboat casinos an hour’s drive away; there is a cow, that… well, you’ll have to read it. There’s a cow. There is pizza, and gangsters. There are Teddy’s tall tales, some of which, startlingly, turn out to be true. And there is sainted Maureen, dead for twenty years yet still directing her family, sometimes in really odd ways. Also tucked into the springs was a baggie that contained the two joints that Irene had confiscated; one full, one half-consumed. My grandmother, Matty thought, is delivering drugs from beyond the grave. The story has plenty of serious moments but the tone here is comic, leading to a climax that is scary at times, but mostly completely bonkers and laugh-out-loud funny. Gregory’s wit is multifaceted, finding the humor (and the truth) in different things. Buddy sought out Irene’s eyes with a classic Buddy look: mystified and sorrowful, like a cocker spaniel who’d finally eviscerated his great enemy, only to find everyone angry and taking the side of the couch pillow. The last of the man’s football-hero good looks had been swallowed by age and carbohydrates. Now he was a blocky head on a big rectangular body, like a microwave atop a refrigerator. Gregory doesn’t skimp on the psychic phenomena, or the paranoid government stuff, and it carries its part of the story right along. 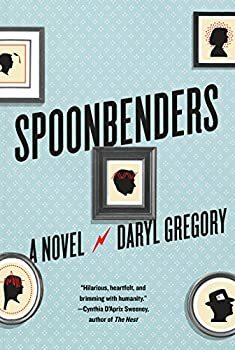 Basically, though, Spoonbenders is a highly entertaining novel about a great, eccentric family. You will love this book for the psychic shenanigans, and your non-fantasy-reading friends and family members will love it for this uniquely American family. I loved every moment of this beautiful hilarious story about the gifted but totally nutty Telemachus family. I knew I was going to love them when Matty, in the first paragraph of the book, tells us that his cousin Mary Alice had announced last year that she would only respond to “Malice.” Daryl Gregory is an amazing storyteller who nails everything in this novel — the humor, the dialogue, the plot, the characters, the suspense. Readers who don’t usually enjoy fantasy may love this one, too. I listened to the audiobook produced by Penguin Random House Audio and read by Ari Fliakos. It’s 14 hours long. Fliakos is fabulous, giving a convincing performance for each character. He easily shifts from Chicago mobster to randy teenage boy to worn-out middle-aged mother to goth girl. This is an audiobook that I can happily recommend and look forward to reading again. It’s going to be one of my favorites of 2017. Spoonbenders is a mindbender! The Telemachus family is an off-the-wall family where at least some of the family members have actual psychic powers. This gets them into more trouble than you can believe, and this story of their lives and the crisis points that buffet them is both hilarious and touching. Spoonbenders is set mostly in 1995, but there are multiple flashbacks as well as points of view, and several twists and surprises along the way. So it’s a novel that requires some attention while reading ― but it’s well worth it! The patriarch of the Telemachus clan is Teddy, a charmer, card shark and supremely skilled con man. In 1962 he meets Maureen McKinnon while they’re both participating in a governmental study of psychic powers. Teddy’s expert con skills have all of his testers fooled, but he can’t figure out how Maureen is pulling off her tricks … or are they tricks? Teddy and Maureen end up marrying, and they have three children who are all gifted with different psychic powers: Irene always can tell if someone is lying to her. Frankie can move objects with his mind … sometimes. His powers are highly erratic. Buddy can see the future, which is a far heavier burden to him than anyone realizes. For a period of time the family makes a living doing psychic shows, billed as the “Amazing Telemachus Family,” but that comes to a screeching halt one day. Thirty-some years later, Maureen is gone and the Telemachus family is a mess. Teddy, an incurable flirt, begins an ill-advised romance with the estranged wife of a mobster. Irene’s power of discerning lies is fantastic for keeping her 14-year-old son Matty in line, but not so great for maintaining a romantic relationship. Add to these things Frankie’s massive debt to the mob, Matty’s unexpected development of psychic powers (unfortunately, they’re only triggered by masturbation or getting high), and Buddy’s difficulties coping with living simultaneously in the present and future. The Telemachus family members find themselves careening from one adventure (or crisis) to the next. Buddy knows it’s all coming to a head very soon, but he’s unable to effectively communicate his concerns to anyone. Daryl Gregory weaves an intricate web of characters and events that initially seems chaotic and convoluted, particularly as the viewpoint jumps back and forth in time and between the points of view of multiple different family members. Each member of the Telemachus family is a distinct and eccentric personality, with exasperating, human flaws that are as unique to each character as his or her particular psychic gift. They all seem to be going different directions, at odds with each other and largely failing to cope with the challenges of life. As a result, the first part of the book occasionally made for frustrating reading, but the humor, the insights into these quirky characters, and the bizarreness of their lives all kept me engaged. Then, as the climactic scenes unfold, the puzzle pieces begin to fit together in a truly awe-inspiring way. Gregory’s ability to pull together so many random-seeming threads was an impressive literary and intellectual achievement. It was almost like one of Teddy Telemachus’ long cons, with unexpected twists and a near-magical payoff at the end. It’s the type of book that I know I’ll want to reread at some point, to appreciate the nuances and the creativity of Spoonbenders. Like its characters, this book is unique, occasionally frustrating, and ultimately heartwarming and extraordinary. Publication date: June 27, 2017. Teddy Telemachus is a charming con man with a gift for sleight of hand and some shady underground associates. In need of cash, he tricks his way into a classified government study about telekinesis and its possible role in intelligence gathering. There he meets Maureen McKinnon, and it’s not just her piercing blue eyes that leave Teddy forever charmed, but her mind—Maureen is a genuine psychic of immense and mysterious power. After a whirlwind courtship, they marry, have three gifted children, and become the Amazing Telemachus Family, performing astounding feats across the country. Irene is a human lie detector. Frankie can move objects with his mind. And Buddy, the youngest, can see the future. Then one night tragedy leaves the family shattered. Decades later, the Telemachuses are not so amazing. Irene is a single mom whose ear for truth makes it hard to hold down a job, much less hold together a relationship. Frankie’s in serious debt to his dad’s old mob associates. Buddy has completely withdrawn into himself and inexplicably begun digging a hole in the backyard. To make matters worse, the CIA has come knocking, looking to see if there’s any magic left in the Telemachus clan. And there is: Irene’s son Matty has just had his first out-of-body experience. But he hasn’t told anyone, even though his newfound talent might just be what his family needs to save themselves—if it doesn’t tear them apart in the process. Harnessing the imaginative powers that have made him a master storyteller, Daryl Gregory delivers a stunning, laugh-out-loud new novel about a family of gifted dreamers and the invisible forces that bind us all. Brad, we have an interview with him next Tuesday and I think you’ll like it. I love Daryl Gregory. He is a first-day auto-buy for me. Spoonbenders is incredible charming, the characters lovingly depicted and the buildup deftly handled. I read recently–it might have been on Twitter — that he does have an idea for a novel set in the WE ARE ALL COMPLETELY FINE universe. I would love to read that!